I have a fondness for Chato and Novio Boy that few picture books can touch. Their newest book? Faaaaaabulous! Some picture book series get progressively less inspired as time goes on. Ian Falconer's, "Olivia" books do this. Ditto "Babar". It's just a common occurrence that people kind of come to expect. You would think that an author like Gary Soto would have used up all his creativity and ideas in the "Chato" series with "Chato's Kitchen" and "Chato and the Party Animals". In much the same way, Susan Guevara's illustrations should, logic dictates, become less entrancing and pleasant to the eye as she brings Chato's world to brilliant life. Yet here I am staring at "Chato Goes Cruisin'" and I can't for the life of me figure out how Soto and Guevara managed to come up with yet another remarkably fresh escapade in the lives of my favorite barrio boys, Chato and Novio Boy. I can't figure it out, but somehow it happened. We should be this lucky with every series. There are distinct advantages that come with eating your cereal every morning. In Chato's case, the advantage is that he now has a chance to enter and win a free cruise for himself and a friend. He enters, wins, and before you know it he and his best friend Novio Boy are off for a vacation of pure relaxation. In theory. The truth of the matter is, when they get to the docks they find a cruise ship occupied entirely by dogs. Well behaved party dogs but dogs just the same. There are dog snacks, dog games, dog videos in the library, and a heckuva lot of howling at the moon. Soon enough, however, the dogs become ill and it's up to our intrepid duo to save the day. But when their rescue boat meets up with the REAL cat cruise, will they keep their promise to the canines or join a far more alluring ride? Once again, Soto gives this book just the right mix of Spanish terms sprinkled alongside English ones. At the same time, Chato and Novio Boy use phrases that sound natural and completely appropriate for the situations they find themselves in. When Chato goes to the library to watch some movies and find only flicks with titles like, "Great Dog Rescues", Chato's reaction is a heartfelt, "Man, this is sorry". The plot makes sense, comes out all right, and the last image of the two slowly cruising in their beautiful car (with the license plate "Vato Gato") brings the whole thing home. 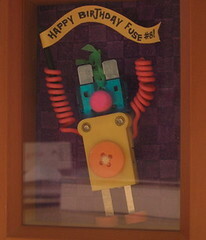 And Susan Guevera just gets more and more creative with every Chato book she illustrates. I liked "Chato's Kitchen" okay when it first came out, but her style at that time struck me as too loose and insubstantial. It began to tighten with "Chato and the Party Animals" and finally here with "Chato Goes Cruisin'" she's hit her peak. She's grown so comfortable with her art that she's willing to shake it up a bit for the sake of amusement. So you have the usual Chato kookiness, but also some very cool black and white comic strips on the bottom of some of the pages to give you a little insight into Chato and Novio Boy's heads. There are also countless amusing details all over this book just waiting for you to find them. When the dogs greet them at the dock, for example, the comic strip on the page shows a flag pointing to their dock with a dog head, and another flag with a cat head pointed in the opposite direction. When our heroes can't sleep for all the howling, they might have been cheered had they known that a cut-away of the boat shows a pack of very busy mice toiling relentlessly in the kitchen. Yum. Then there are the details that I think make it work the best. Novio Boy retains his title as the sexiest cat in children's literature (check out the shot of him lifting weights). And both he and Chato sport some mighty fine facial hair, making them the only felines I can think of to sport goatees and `staches in picture book fare. Hard to object to anything in this book, really. 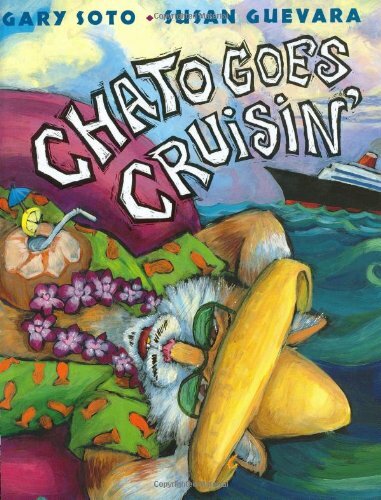 If you enjoyed the first two installments in Chato's adventures then the best thing I can say about, "Chato Goes Cruisin'" is that it does its predecessors proud. Funny, filled with great slang in English and Spanish alike, and just a rousing adventure, it's the best of the "Chato" lot and a fine fine purchase.